2, is the simplest molecular ion. It is composed of two positively charged protons and one negatively charged electron, and can be formed from ionization of a neutral hydrogen molecule. It is of great historical and theoretical interest because, having only one electron, the electronic Schrödinger equation for the system (in the clamped-nuclei approximation) can be solved in a relatively straightforward way due to the lack of electron–electron repulsion (electron correlation). The analytical solutions for the electronic energy eigenvalues are a generalization of the Lambert W function which can be obtained using a computer algebra system within an experimental mathematics approach. Consequently, it is included as an example in most quantum chemistry textbooks. 2 was published by the Danish physicist Øyvind Burrau in 1927, just one year after the publication of wave mechanics by Erwin Schrödinger. Earlier attempts using the old quantum theory had been published in 1922 by Karel Niessen and Wolfgang Pauli, and in 1925 by Harold Urey. In 1928, Linus Pauling published a review putting together the work of Burrau with the work of Walter Heitler and Fritz London on the hydrogen molecule. 2 can be described as a covalent one-electron bond, which has a formal bond order of one half. The ion is commonly formed in molecular clouds in space, and is important in the chemistry of the interstellar medium. 2 with clamped nuclei A and B, internuclear distance R and plane of symmetry M.
u (2pσu), which is ungerade. 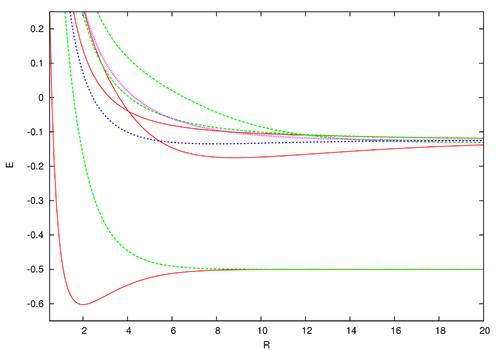 2 as a function of internuclear distance (R) in atomic units. See text for details. which exponentially vanishes as the internuclear distance R gets greater. The lead term 4/eRe−R was first obtained by the Holstein–Herring method. Similarly, asymptotic expansions in powers of 1/R have been obtained to high order by Cizek et al. for the lowest ten discrete states of the hydrogen molecular ion (clamped nuclei case). For general diatomic and polyatomic molecular systems, the exchange energy is thus very elusive to calculate at large internuclear distances but is nonetheless needed for long-range interactions including studies related to magnetism and charge exchange effects. These are of particular importance in stellar and atmospheric physics. u states. The blue dashed line is a 2Πu state and the pink dotted line is a 2Πg state. Note that although the generalized Lambert W function eigenvalue solutions supersede these asymptotic expansions, in practice, they are most useful near the bond length. These solutions are possible because the partial differential equation of the wave equation here separates into two coupled ordinary differential equations using prolate spheroidal coordinates. The dihydrogen ion is formed in nature by the interaction of cosmic rays and the hydrogen molecule. An electron is knocked off leaving the cation behind. 2 + e− + cosmic ray. Cosmic ray particles have enough energy to ionize many molecules before coming to a stop. 2) with a peak cross section at around 6985128174118959999♠8000 eV of 6984800000000000000♠8×10−16 cm2. An artificial plasma discharge cell can also produce the ion. 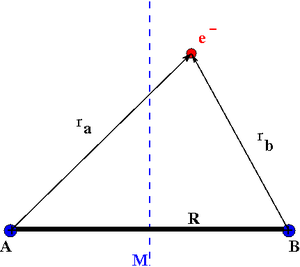 ^ Scott, T. C.; Aubert-Frécon, M.; Grotendorst, J. (2006). "New Approach for the Electronic Energies of the Hydrogen Molecular Ion". Chem. Phys. 324 (2–3): 323–338. arXiv:physics/0607081. Bibcode:2006CP....324..323S. doi:10.1016/j.chemphys.2005.10.031. 2) im Normalzustand". Danske Vidensk. Selskab. Math.-fys. Meddel. (in German). M 7:14: 1–18. 2) in their normal position" (PDF). Naturwissenschaften (in German). 15 (1): 16–7. Bibcode:1927NW.....15...16B. doi:10.1007/BF01504875. ^ Karel F. Niessen Zur Quantentheorie des Wasserstoffmolekülions, doctoral dissertation, University of Utrecht, Utrecht: I. Van Druten (1922) as cited in Mehra, Volume 5, Part 2, 2001, p. 932. ^ Pauli W (1922). "Über das Modell des Wasserstoffmolekülions". Annalen der Physik. 373 (11): 177–240. doi:10.1002/andp.19223731101. Extended doctoral dissertation; received 4 March 1922, published in issue No. 11 of 3 August 1922. ^ Urey HC (October 1925). "The Structure of the Hydrogen Molecule Ion". Proc. Natl. Acad. Sci. U.S.A. 11 (10): 618–21. Bibcode:1925PNAS...11..618U. doi:10.1073/pnas.11.10.618. PMC 1086173. PMID 16587051. ^ Pauling, L. (1928). "The Application of the Quantum Mechanics to the Structure of the Hydrogen Molecule and Hydrogen Molecule-Ion and to Related Problems". Chemical Reviews. 5 (2): 173–213. doi:10.1021/cr60018a003. ^ Clark R. Landis; Frank Weinhold (2005). Valency and bonding: a natural bond orbital donor-acceptor perspective. Cambridge, UK: Cambridge University Press. pp. 91–92. ISBN 978-0-521-83128-4. ^ Huber, K.-P.; Herzberg, G. (1979). Molecular Spectra and Molecular Structure. IV. Constants of Diatomic Molecules. New York: Van Nostrand Reinhold. 2: Calculation of exponentially small terms and asymptotics". Phys. Rev. A. 33: 12–54. Bibcode:1986PhRvA..33...12C. doi:10.1103/PhysRevA.33.12. ^ Scott, T. C.; Dalgarno, A.; Morgan, J. D., III (1991). "Holstein-Herring Method". Phys. Rev. Lett. 67 (11): 1419–1422. Bibcode:1991PhRvL..67.1419S. doi:10.1103/PhysRevLett.67.1419. ^ Hadinger, G.; Aubert-Frécon, M.; Hadinger, G. (1989). "The Killingbeck method for the one-electron two-centre problem". J. Phys. B. 22 (5): 697–712. Bibcode:1989JPhB...22..697H. doi:10.1088/0953-4075/22/5/003. ^ Pique, J. P.; et al. (1984). "Hyperfine-Induced Ungerade-Gerade Symmetry Breaking in a Homonuclear Diatomic Molecule near a Dissociation Limit: 127I2 at the 2P3/2 − 2P1/2 Limit". Phys. Rev. Lett. 52 (4): 267–269. Bibcode:1984PhRvL..52..267P. doi:10.1103/PhysRevLett.52.267. 2". Phys. Rev. Lett. 86 (9): 1725–1728. Bibcode:2001PhRvL..86.1725C. doi:10.1103/PhysRevLett.86.1725. ^ Padovani, Marco; Galli, Daniele; Glassgold, Alfred E. (2009). "Cosmic-ray ionization of molecular clouds". Astronomy & Astrophysics. 501 (2): 619–631. arXiv:0904.4149. Bibcode:2009A&A...501..619P. doi:10.1051/0004-6361/200911794. This page was last edited on 21 April 2019, at 21:28 (UTC).